Aknicare prescriptions are currently not available via our online consultation service. You can, however, request an online consultation for acne treatment. The Aknicare line consists of three products, Aknicare cleanser, Aknicare lotion and Aknicare cream. These three products have been formulated to work synergistically together as a remedy for treating greasy and impure skin types. Aknicare products can be used as an autonomous treatment as well as in combination with other products. 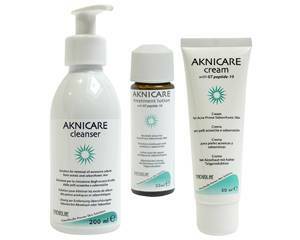 Aknicare cleanser is a gentle product which thoroughly cleanses greasy and impure skin. It contains two active ingredients, triclosan and pyruvate, which help keep the skin's flora in balance and combat abnormal hardening. Apply the cleanser as you would apply a liquid soap. Allow to work for two to five minutes before rinsing. Aknicare lotion is a water-free lotion packed with active ingredients. It reduces the secretion of sebaceous matter and effectively prevents the formation of comedones (blackheads). After cleaning the skin with Aknicare cleanser, dab the lotion directly on the greasy areas of the skin using the soft sponge. Aknicare cream is a light emulsion which consists of three active ingredients: ethyl linoleate, zinc lactate and hyaluronic acid. These ingredients combat excessive sebaceous gland activity at the source. Aknicare cream restores hydration. Apply the cream after using the cleanser and lotion. Massage in gently until fully absorbed.